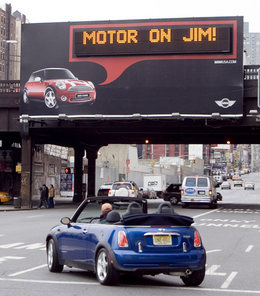 The boards, which usually carry typical advertising, are programmed to identify approaching Mini drivers through a coded signal from a radio chip embedded in their key fob. The messages are personal, based on questionnaires that owners filled out. Everywhere that John Anderton (Tom Cruise) went, his eyes were being scanned for identification. I’m not talking just about restricted areas - he was scanned entering the Metro, driving home from work, and even walking into The Gap. The advertisements called him by name: “John Anderton, we have the ideal vacation for you!” and “John Anderton, wouldn’t you like a pint of Guinness?” But not even a pint of Guinness would have soothed my nerves after hearing my name called out all day long. If you thought spam was annoying, you ain’t seen nothing yet. The Mini story via Pondering Primate. In related news, gestures in the iPhone will of course bring Minority Report -style computing for us too. I wonder when Nokia’s Maemo devices get that too. 10 April 2007. 2 minute read. This morning I’ve been exploring the Jaiku service. 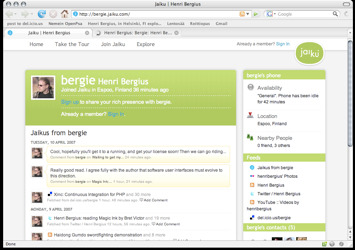 Jaiku is a combination of a social web service and a mobile phone application that takes the personal status and presence ideas of Twitter quite a bit further. The idea is to combine data from various services to provide a presence feed that can be shared with friends and colleagues. 18 December 2005. 2 minute read.